The wine was no longer vinified in the family winery since 1985, which was no more than a big storeroom. The operation was running slowly. Isabelle’s brother, Laurent, carried the harvest to the cooperative, cultivating only 80% of the original 25 ha. “It’s been a few years since I felt a need to change pace, the numbers, the airports, the management, I had more than enough, I was looking for, without really looking for another life.” It was during one of his Christmas size that everything rocked, “in a slow moment of emptiness, that was what I wanted to do!” That, the vine, the earth, the wine. Nathalie was ready. She talks to Laurent about his idea. That echoes his project of new life. The project will only take a year to materialize. But we do not improvise winegrowers. After writing an action plan, Nathalie resumes operations in May. She created a Farm Limited Liability (EARL) in November 2011. “I also salute Laurent’s courage, that of rethinking together the new conduct of the vineyard, the goal being to gradually win the winemaking ourselves. We have chosen to start by vinification only 10% of the harvest, the rest goes to the cooperative. ” At the same time, the real work of restructuring the vineyard begins. A project over 8 years. Progressive uprooting and replanting. “A titanic job, not to mention the renovation of the cellar, the purchase of all the necessary equipment”. And to train. 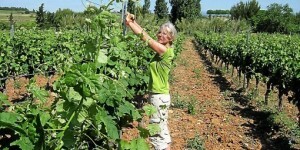 The former manager follows throughout 2012 a training in viticulture-oenology two days a week at the Adult Education Center in Montpellier.